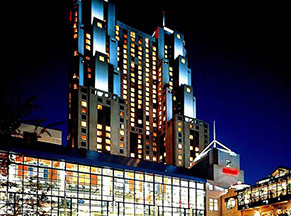 Our host hotel for the 2019 GPA Midstream Convention is the Marriott Rivercenter in San Antonio, which is where registration and most of our events will be held. Some events will be held at the Marriott Riverwalk, which is directly across the street from our host hotel. Attendees are responsible for making their own reservations, and while both of the Marriott properties have sold out, attendees may call A Room With A View for information about official designated GPA Midstream overflow hotels. A Room With A View will secure the lowest available rates at the best available hotels within walking distance of the Marriott hotels, and reservations processed by A Room With A View are automatically placed on a waiting list for rooms at both Marriott hotels should cancellations occur within the GPA Midstream block. This is a free service for GPA Midstream Convention attendees. A Room With A View may be reached by calling (800) 780-4343, Monday - Friday, 9 a.m. - 5 p.m. CST. Attendees from outside of the United States should e-mail reservations@aroomwithaview.net.